Once the DNAzure® solution is diluted to 1X, how long can it be stored? For optimal staining, we recommend diluting the 100X DNAzure® stock to 1X working solution fresh each time. However, if a 1X solution stored at 4°C and protected from light, the gel stain should to be good up to two weeks. 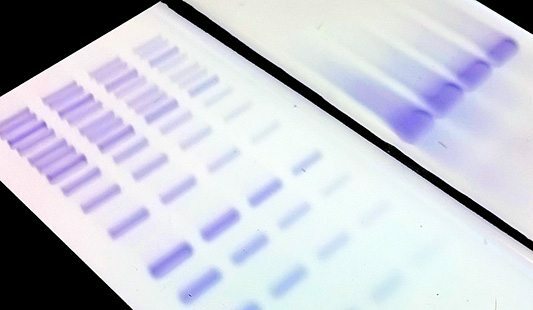 Can the 1X DNAzure® staining solution be re-used? Yes, the 1X DNAzure® staining solution can be re-used for multiple gels, under certain conditions. Importantly, the staining solution must be removed from the gel before the gel is exposed to light to develop the bands. If the staining solution undergoes the light exposure, it will not be able to stain another gel. The used staining solution should be stored in the refrigerator, protected from light, between uses. 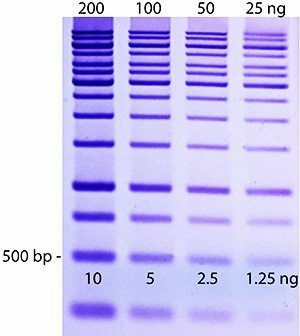 We have successfully re-used the staining solution stored for up to 2 weeks, and used up to 4 times with little loss of signal (after 5 or 6 uses, the sensitivity was noticeably lower). Can DNAzure® be stored at room temperature? We recommend storing DNAzure® at 4°C. After storage at room temperature, we have seen some loss of dye stability. 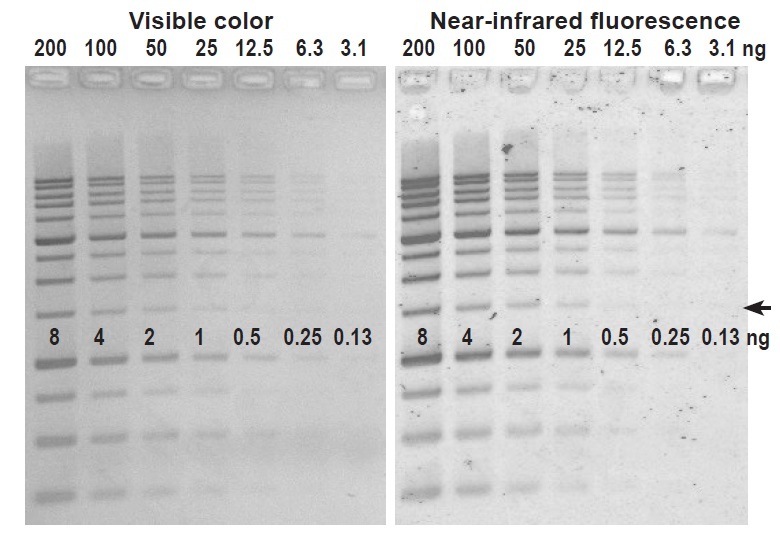 Visualize DNA bands in gels by eye, with detection sensitivity rivaling most fluorescence-based gel stains. Key to the technology is a DNA-binding dye that turns from colorless to deep blue upon exposure to light. Biotium’s 1 kb DNA ladder was loaded on a 1% agarose gel in two-fold dilutions, ranging from 200 ng to 25 ng total ladder per lane. The mass of the 500 bp band in each lane is labeled. 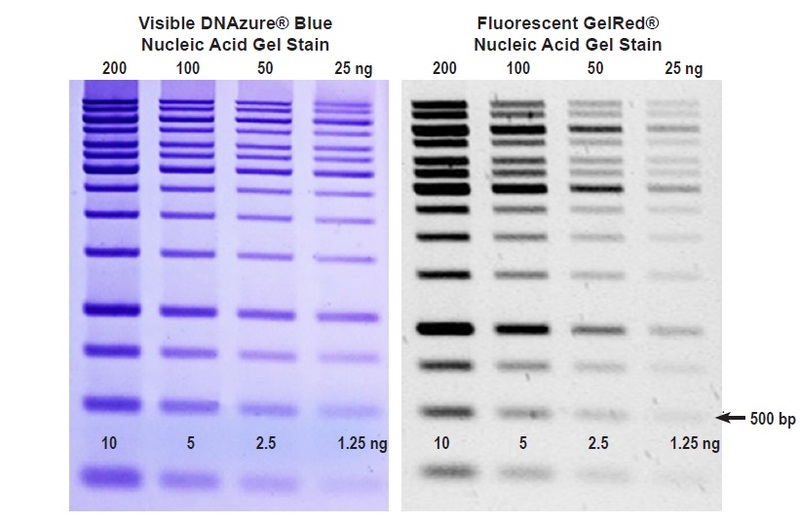 The gel was stained with DNAzure® Blue Nucleic Acid Gel Stain for 25 minutes, and then the visible blue DNA bands were developed for 30 minutes using the Glo-Plate™ Blue LED transilluminator. The gel was placed on a white light transilluminator and imaged with a cell phone camera. 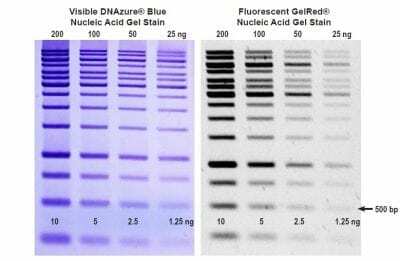 After incubation with DNAzure® Blue Nucleic Acid Gel Stain, the gel must be exposed to bright light to facilitate the development of dark blue DNA bands. Light exposure can be performed with a variety of white and blue light sources. 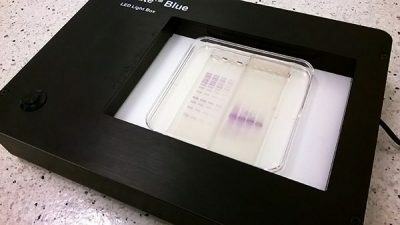 For best results, we recommend performing the light exposure with either the Gel-Bright™ LED Gel Illuminator or the Glo-Plate™ Blue LED Illuminator. 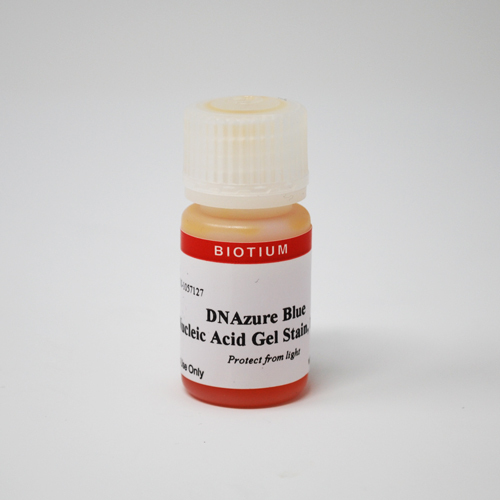 Both devices produce blue light from LEDs and are very effective at rapidly producing the color change in DNAzure®-stained gels. 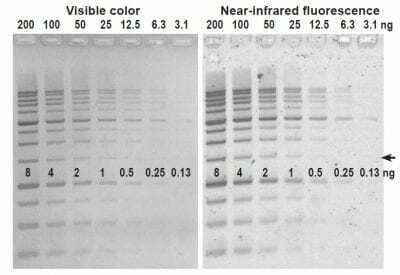 The Gel-Bright™ is also an excellent instrument for viewing gels stained with the fluorescent green DNA gel stain, GelGreen®. LI-COR and Odyssey are registered trademarks of LI-COR Inc.